The Crabill Homestead in Springfield will be open for family-oriented thrills Oct. 16-17. 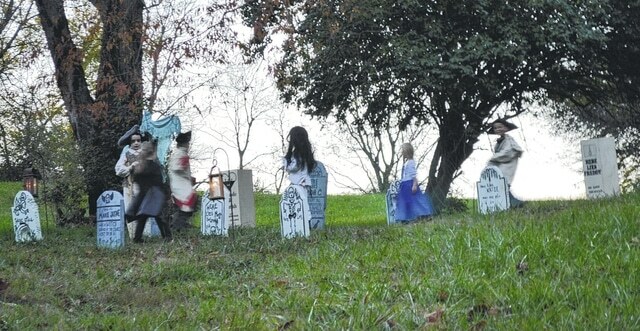 SPRINGFIELD – The Crabill Homestead will celebrate All Hallow’s Eve Oct. 16-17. Each room will be decorated to keep the ghosts, fairies (these fairies are not the nice kind) and demons away. The upstairs rooms will be decorated with unusual curiosities. This is a family-friendly event with no one jumping out to scare you. All Hallow’s Eve comes from the Druids of the Celtic areas in what is now Ireland, Great Britain, Scotland, Wales and France as part of their pre-Christian beliefs. Oct. 31 was a day to honor the dead and to help them pass on, as the Druids believed they needed help. Offerings of food and drink would be left out to placate the souls, so they would not disturb the inhabitants of each dwelling. Those who needed to go out in the night of All Hallow’s Eve disguised themselves to hide from the souls. The Crabill Homestead will be open 6-10 p.m. Friday, Oct. 16, and 6-9 p.m. Saturday, Oct. 17. The cost is $5 for those 16 and older, $3 for ages 6-15, and free for ages 5 and under. Refreshments will be available for purchase. The homestead will also be open its normal hours of 1-3 p.m. Sunday, Oct. 18. The Crabill Homestead is located at 2800 Croft Road, Springfield, within the C. J. Reservoir area off Croft Road. Learn about the Homestead at www.crabillhomstead.org and on Facebook at Crabill Homestead. Submitted by George Rogers Clark Heritage Assocation.